From breakfast until dinner, the kitchen serves as the hub and is the heart of any home. With a room that is used so often, it is easy to get caught up and before you know it your once trendy kitchen becomes yesterday’s news. 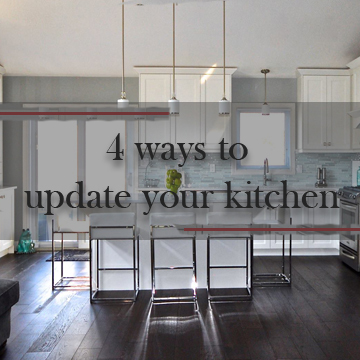 Here are 4 ways to rejuvenate your kitchen space, helping you combine practicality and style for years to come. Kitchen countertops play a huge role in the overall look of your kitchen. To update, consider ditching your vinyl countertops and replace them with stylish and functional granite for that modern look. Not only does granite look great, their hard and durable properties make them a very functional addition to any kitchen. This means you won’t need to replace them again anytime soon – and when they look as great as they do, why would you even want to? As we talked about before, the kitchen has evolved in recent years. Where it was once only a space for cooking, the kitchen now serves as the center of the daily workings of the family. Consider adding a seating area to accommodate everything from friends coming over to catch up, or even the kids doing their homework. As our society continues to develop a greater environmental consciousness, eco-friendly is becoming an increasingly popular design feature. So it is well worth updating this space with the latest eco-friendly designs and appliances. Adding the latest energy efficient appliances to your kitchen is an excellent way to keep up to date ensuring your kitchen doesn’t get left in the dark ages. Lighting often is an afterthought when it comes to your kitchen design, but the truth is lighting can influence a kitchens ability to make an impact. The important thing to think about is ambience. While a big bright kitchen might have worked kitchens in the past, the modern spaces rely on versatile lighting to match the rooms new role as a social hub. Following these tips will help you refresh your kitchen and achieve a stylish modern space that will remain trendy for years to come.